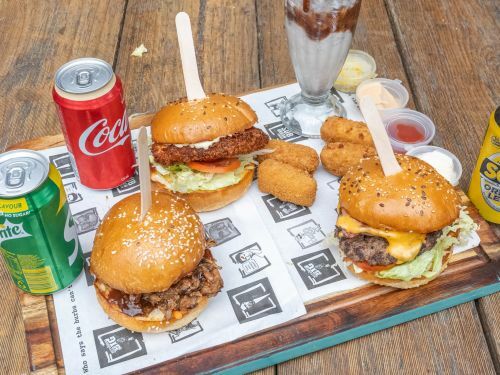 Suburban Burger uses their own specialised couriers to deliver their food. Egg, bacon, cheese, and relish. Snag, tasty cheese, free range egg, and BBQ sauce. Rocket or lettuce, avocado, relish, tomato, and egg. Any breakfast burger, hash brown, and juice or coffee. Small combo comes with small chips and soft drink. Medium ombo comes with medium chips and soft drink. Large combo comes with large chips and soft drink. Gippsland angus, bacon, lettuce, tomato, tasty cheese, onion, pickles, mustard, and ketchup. 12 hour slow cooked pulled pork, hickory bacon, crackling, house made slaw with OKC gravy. Crumbed chook breast, lettuce, tomato, smoked ham, grilled mozzarella, and napoli sauce. Gippsland angus, 2 slices of cheese, ketchup, mustard, onion, and pickle. Gippsland angus, cheese, bacon, grilled onion, mayo, and BBQ sauce. 2 x beef patty, melted burger cheese, lettuce, tomato, avocado, free range egg, bacon, grilled onion, mustard, and ketchup. Crumbed chicken breast, lettuce, tomato, and mayo. Crumbed chook breast, melted cheese, jalapenos, and chilli mayo. Grilled chicken breast, bacon, pineapple, avocado, lettuce, tomato, and mayo. Grilled chicken breast, lettuce, tomato, avocado, tasty cheese, aioli, and relish. Scalloped potato, mint jelly, rosemerry and garlic lamb, roast gravy, mushy peas, and pumpkin mash. Green lentil vege patty, 2 x burger cheese, sour cream, and secret spicy sauce. Burger cheese, popular suburban chips, onion rings, smashed maccaroni cheese bites, aioli, and relish. Beetroot brioche, lettuce, tomato, beetroot, organic vege patty, and mayo. Gluten free vege patty, grilled mushroom, grilled onion, lettuce, tomato and sweet chilli sauce. Gluten free organic red lentil patty, avocado, sour cream, nachos, jalapenos, melted cheese, grilled onion and salsa. Kids cheese burger with kids chips, ketchup dip. Choice of a kids drink and activity pack. Kids chicken burger with small kids chips, ketchup dip. Choice of a kids drink and activity pack. 4 tempura chicken nuggets with a small kids chips, ketchup dip. Choice of a kids drink and activity pack. 4 maccaroni cheesy bites with small kids chips, ketchup dip. Choice of a kids drink and activity pack. Mesclun lettuce, spinach rocket, tomato, cucumber and spring onion with choice of your dressing. Fresh spinach, toasted almonds, chicken, splash of lemon juice and olive oil with choice of your dressing. Fresh rocket, dried cranberries, sunflower seeds, pistachio, danish feta with choice of your dressing. Chicken, spinach, rocket, Spanish onion, almond, dried cranberry, avocado with choice of your dressing. Spinach, rocket, tomato, cucumber, spring onion, camembert, avocado, sunflower seeds with choice of your dressing. Fresh spinach, rocket, beetroot, danish feta, walnuts, sunflower seeds and chicken with choice of your dressing. All create your own salads comes with meslum lettuce and choice of your dressing. Ingredients to choose from 6 max. Route 66 style with house made beef chilli con carne and topped with cheese. Toastadas, cheese, jalapenos, guacamole, and salsa. Crispy baked fries loaded with pulled BBQ pork, grilled mushrooms and onion and lots of cheese.